Are you looking for a way to motivate your young readers, involve them in active learning, and help them build language skills -- all in the same lesson? Why not use the Web to enhance the reading process? In this Education World story, teacher Hazel Jobe points out some of the best Web sites to use in reading instruction! Are you looking for a way to motivate your young readers, involve them in active learning, and help them build language skills -- all in the same lesson? Why not use the Web to enhance the reading process? Before you introduce young students to the power of the Web, you may wish to provide some simple lessons in "safe surfing." (Keeping students safe on the Internet is always a concern for teachers.) Several Web sites may help build your students' reading and comprehension skills while they learn to use the Internet safely! Iggey and Rasper's Internet Safety Game teaches students about staying safe and using good manners on the Internet. Students read the safety rules and then play the game. Students can read CyberNetiquette Comix, Disney's interactive comic books that teach on-line safety in a fun way. Students seem to learn best when their reading incorporates content from a variety of subject areas. Many resources on the Web tie reading to other areas of the curriculum. Among them are two Web pages this author created that might serve as guides for teachers who want to integrate the Internet, language arts, and content areas of the curriculum. The first site is [email protected]: Exploring the Ocean Through Literature, an extensive Web resource consisting of Web-based learning activities that integrate language arts with oceanography. Each of the seven adaptable activities is based on a children's book about the ocean. The site includes writing activities, games and puzzles, art ideas, Web resources, and a special section just for teachers. Then you might check out Dino-Mania, a Web site that integrates the study of dinosaurs with language arts. Web-based learning activities for eight children's books about dinosaurs include writing activities, games and puzzles, and examples of student work. There is an extensive list of Web resources and a section for teachers. MEET FAVORITE AUTHORS AND CHARACTERS! Students can contact and interact with authors through Web sites. Such notable authors as Jan Brett, Eric Carle, Suse MacDonald, and Dr. Seuss have official Web sites that include activities to go along with their books. Students can even post a message to Hedgie or send e-mail to the Cat in the Hat. Teachers and students will find familiar, lovable characters from their favorite books at home on the characters' own Web pages. Young students love the Berenstain Bears and will enjoy a visit to Berenstain Bear Country and a tour of the Bears' Tree House. They can solve Sister Bear's secret message, visit the library, or e-mail the whole family. Pictures from Just Me and My Dad tell this Little Critter story by Mercer Mayer. Students can read the entire story on-line and then write stories about themselves and their dads. For an Earth Day activity, read The Lorax, by Dr. Seuss. Then have your students play The Lorax's Save the Trees Game. The famous aardvark is at home on the Web at Arthur. Students can e-mail Arthur or send postcards to their families and friends. Click on Arthur's Postcards to get to Arthur's easy-to-follow Letter Writer Helper. Visit everyone's favorite monkey, Curious George, and read a mini-adventure or join the forum. WRITING ON THE NET -- AND POETRY TOO! Making the connection between reading and writing is crucial to improving literacy skills in young students. Sites such as KidLit, Young Writer's Workshop, and Stone Soup encourage students to send in stories, poems, and essays for publication. Seeing their work published for a worldwide audience is a powerful incentive for students to write. The Web's colorful graphics, sounds, and animations can make Web-based reading very appealing. Many sites offer students opportunities to interact with story characters and to make choices as they read. For example, Theodore Tugboat is a popular site for young students. They can help Theodore decide what to do next in the story, have a story read to them by the computer, or enjoy the games and puzzles. At Wacky Tales, students can enter words to complete wacky tales. They'll enjoy reading them back to fellow students. If you'd like to share poetry with your young readers, the whimsical Poetry for Kids, by Ken Nesbitt, is sure to be a favorite. After reading some of the on-line poems, students might write some original poetry in the same style. Mother Goose Rebus Rhymes is another good place for young students to practice their reading skills. Students can visit the Favorite Poem Project, where U.S. Poet Laureate Robert Pinsky shares audio and video of people reading their favorite poems. Students are invited to participate by sending in their favorite poems. Little Explorers Picture Dictionary with Links Select a letter of the alphabet, and a screen of words beginning with that letter pops up. Each word is illustrated and many words link to Web sites related to the word. Kids can have many hours of interactive fun on this site! Space ABC's Students can read and listen to student-written stories that correspond to each letter in the alphabet. Jack's House Kids learn the alphabet by moving the letters into the correct position. Grandad's Animal Book This interactive book has a poem and a picture for each letter. A click of the mouse lets the young reader select an animal. There is also a multiple-choice quiz. Emmi's Critter ABC's Here kids will find a picture and a verse for each letter of the alphabet. A LIBRARY OF LANGUAGE LESSON PLANS! Teachers, you don't need to reinvent the wheel! Many sites, offering tons of lesson plans and ideas for using the Web, can enhance your reading curriculum. You might take a look at just a few of these sites. SCORE Cyberguides Here you'll find Web-delivered units of instruction based on literature. Each guide has a student section and a teacher section. Guides are available for grades K- through 12. Carol Hurst's Children's Literature Site The site collects reviews of children's books with suggestions for use in the classroom. The Mailbox provides holiday ideas, freebies, an idea exchange, and more. Education Place TeacherViews This site includes reviews of favorite children's books and ideas for use in the classroom -- all written by teachers! Welcome to Jan Brett's Homepage Take a look at "Piggybacks for Teachers" to use with many of her books. 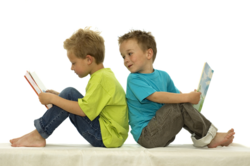 25 Ideas to Motivate Young Readers! ABC Books Aren't For Babies!